According to a Korean rating. 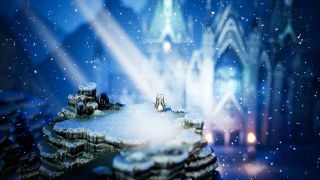 Octopath Traveler, Square Enix's absolutely gorgeous Switch RPG, could be jumping the fence and launching on PC, if a rating from Korea's Game Rating and Administration Committee is accurate. The rating appeared today and the page has since been taken down, but ResetEra member Rodjer managed to capture it before it vanished into the ether. The PC version will be published by Bandai Namco, apparently, at least in Korea. Octopath Traveler launched on Switch last year, where it's gathered quite a large audience. It's an unusual juxtaposition of old SNES-era JRPGs and modern experiments, from the striking 2D-HD aesthetic to the turn-based battle system that hides more than a few twists. It's also eight RPG adventures in one, with eight heroes with unique origins, skills and quests. So far it's only appeared on Switch, though a mobile prequel was announced last month. The free to play game will retain the style and some of the features of the original, but with larger battles, more characters and post-launch story additions. The timing means it's plausible that this is actually what's coming to PC, though it would be a little bit odd if we only got a mobile prequel and not the main game. I've reached out to Square Enix to find out if the listing was accurate.